Remove all leaves of the artichoke until to arrive to the heart. Use a teaspoon to remove the fibrous ‘choke’ buried in the center. Discard that part. Blanch your cleaned artichokes in some boiling water for 2 minutes. Drain and set aside. Heat up some olive oil in a pan on medium heat and once it’s heated add your artichokes. Fry on both sides for a few minutes ensuring they do not burn. Add your garlic and peperoncino and give everything a good toss and stir. Add the spaghetti, a little bit of pasta water (couple of tablespoons) and combine everything together – keep on heat for another minute or two to let the water absorb. 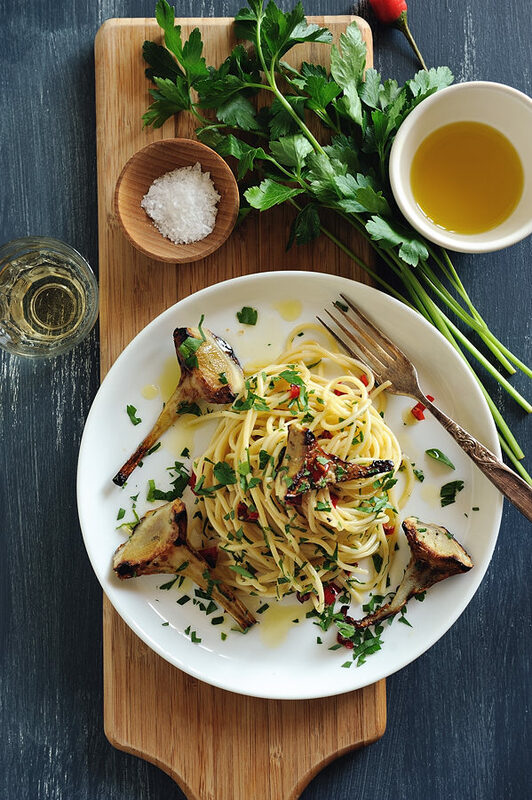 Plate the spaghetti with the artichokes and garnish with freshly chopped parsley.